Commonly, with most people in the gym is that they find a rep range where they have gotten results from, but never move out of it. The results will tend to plateau unless you change up your routine. More often than not, gym goers will be quite comfortable changing their exercises, but are not so sure when it comes to training in a different rep range. Strength training is associated with lower reps, heavier weights and will develop neural adaptations. Essentially it will help the body fire up as many muscles as possible in a coordinated fashion, allowing you to lift as much weight as possible. Your average lifter tends to miss out on this lower rep range. Using strength training, you will be within the area of hypertrophy, which is the increase in muscle mass, which is also true at higher reps. However, with the worry of getting too bulky, people tend to avoid this rep range. You are not going to get bulky working in this rep range. This will come from a surplus in calories and training frequently with heavy weights. Bodybuilders will be training at very high intensities to look like much bigger. It’s not something you accidentally get overnight just from lifting a few sets of heavy reps. Try not to forget that to increase in muscle mass is to improve body composition. Every pound of muscle you have burns roughly 50 calories per day, which means it is excellent at fighting the storage of fat. Because of the neural adaptations mostly associated with strength training, your body will communicate better with your muscles via the nervous system. Gaining strength after working with a low-end rep range will allow you to go into a higher rep range, with the ability to lift heavier weights than before. Being stronger in a more hypertrophy phase (typically 8-12 reps), you’ll be able to shift heavier weights, getting even better results than if you were to just stick in the hypertrophy range. So try some strength training. I’d suggest putting the heavy reps in at the start of your routine, with some compound lifts (exercises that use 2 or more joints) and then move into some higher rep stuff. You want to have impeccable form when using heavy weights so as to reduce the risk of injury, and you want to ingrain into your nervous system the correct movement patterns. This is why you want them in at the start before you feel too fatigued. Perfect practice makes perfect. Hands as close your shoulders as your shoulder mobility allows. Make sure bar doesn’t sit on your spine. Take a step back after unracking. Let the bar settle before you begin your squat. Look forward throughout the squat, or look slightly down, as if you are looking around 7 foot in front of you. Stand at a width you feel is comfortable. Turn your toes out between about 5-15 degrees should do. Deep breath in, try to fill your belly with air and hold it in. Break at the hips and the knees as and when it feels right during the squat. Some will say hips first, some will say knees first. Drop down as far as you can comfortably go, but try to aim for just beneath parallel (hip crease beneath knee). Make sure knees don’t cave in, try to keep them in line with your toes. Press into the floor as you come back up, evenly through the feet (not too much towards the heels, not too much towards the toes). Look to breathe out at the top. If you find a sticking point, let air out but not all of it. You want to keep air in for stability. Mobility bonus: If you find it difficult to hit just beneath parallel, you can try standing on thin blocks or weight plates to increase your mobility. Hands on bar, thumbs wrapped round. Make sure when you are pressing you have a grip width that means you have a vertical forearm through at least at some portion of the movement. Pull your shoulder blades together. After unracking the bar, keep wrists over your shoulders. Knuckles facing the ceiling, keep forearms in line with your wrists. Big breath in to begin. 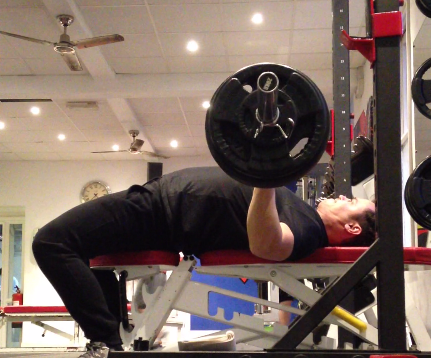 Take the bar down to the sternum, a slight tucking of the elbows. Breathe out as you finish the press. If you find a sticking point, let out little bits of air if required. End up with your wrists over your shoulders. Try placing blocks, or weight plates, under your feet. This will flatten your back and hopefully take that pain away. Don’t place your feet on the bench as that will take away your stability, it’s unnecessary to do so and you will bench less doing that. Hold the kettlebell (or a dumbbell if you don’t have a KB) by the horns (handles) at chest height. Don’t let it lean on your chest. Stand tall, big belly breath in and hold. Feet about hip width or slightly wider. Drop down into your squat. Drop down into your squat (steadily, under control) and try to get as low as possible. Try to get your thighs to touch your calves. Don’t worry if your lower back rounds out. Keep strength in your upper back. Press into the floor to come back up into your start position, locking your knees and your hips.